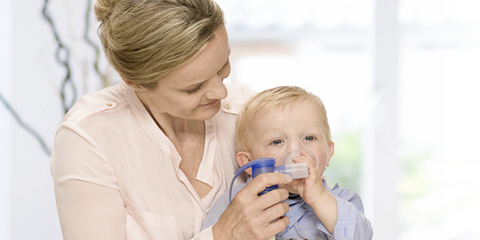 Do you use a mask when using a nebuliser with your child? Then please always make sure that it is on correctly. You can use our soft inhalation masks for babies and toddlers. While holding your baby on your arm, lean back so you can relax. Thanks to the bend, you can sit in a comfortable position. Your child should start using a mouthpiece by about the age of three. For babies and toddlers up to the age of two, PARI has soft, well-fitting masks with a bend available. To correctly perform the nebuliser therapy with your child, gently hold the inhalation mask on your child’s or baby’s face for the entire treatment period. 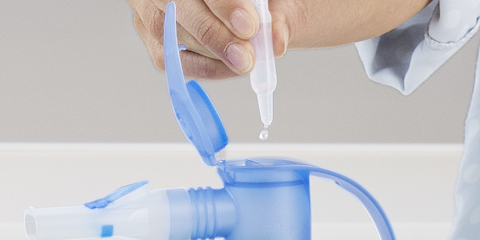 We advise that you monitor the mask continuously to make sure that a tight seal is maintained throughout the nebuliser therapy, because this is the only way to achieve the desired inhalation effect. The bend, like the one that comes with the PARI LC SPRINT Baby nebuliser, also helps you sit in the most relaxed position possible. For example, when you administer the nebuliser therapy with your child in your arms. The bend can be rotated to whatever position is desired, just so long as you make sure that the nebuliser is held vertically while doing so. In general, a more potent therapeutic effect can be achieved with the mouthpiece than with the inhalation mask. So you should try to switch to using the mouthpiece as soon as possible, but at the latest by the time your child turns three. Keep having your child try it and when your child can keep his or her lips tightly around the mouthpiece, you can switch to using it. Show and instruct your child how to inhale and exhale slowly and in a calm manner using the mouthpiece. It is very easy to observe if your child is exhaling correctly through the opening of the valve on the mouthpiece. From what age are children able to use nebuliser therapy properly? In principle, children of any age can use a nebuliser with the exception of PARI SINUS for the upper airways which can only be used from the age of six years. More and more parents are discovering that they can use nebuliser therapy with saline solutions for their children and themselves to prevent colds. If medications, like those used to treat bad colds and respiratory diseases, need to be administered, often inhaling them using a nebuliser is the only way to transport the medications safely to a baby’s tiny airways. In general, parents should always consult their child’s paediatrician, even for colds. 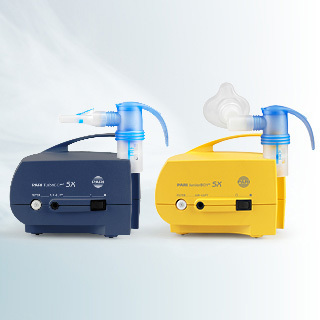 Using nebulisers with children requires time, a calm environment and sometimes even a soft. For the treatment to be successful, a positive experience is key.